Ardo (or Ardonus, possibly short for Ardabastus; died 720/721) is attested as the last of all Visigothic kings of Hispania, reigning from 713 or likely 714 until his death. The Visigothic Kingdom was already severely reduced in power and area at the time he succeeded Achila II, and his dominions probably did not extend beyond Septimania and present-day Catalonia, due to the Arab conquests of the previous three years. 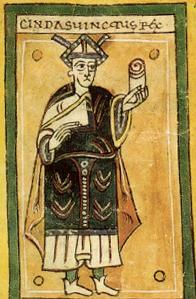 Ardo is only recorded in one Visigothic regnal list as reigning for seven years. As of 716 the Arabs crossed over the Pyrenees and invaded Narbonensis, the last province under Gothic control. Over the next three years Ardo probably defended what remained of the Visigothic kingdom and he "may have gone down fighting like his predecessor" after the Arabs took Narbonne and before they conquered all that remained of the old kingdom. The Balt dynasty or Balth dynasty (Latin: Balti or Balthi, Balts) was the first ruling family of the Visigoths from 395 until 531. They led the Visigoths into the Western Roman Empire in its declining years. According to the historian Ablabius, as reported by the historian Jordanes, the Visigoths had been ruled by the Balti since ancient times. Jordanes, however, says that all the Goths were formerly ruled by the Amal dynasty. Relying on Cassiodorus, Jordanes says that the Balts were "second" after the Ostrogothic Amals. He claims that the family was named from long ago for its daring: "Baltha, which [in Gothic] means bold" (Baltha, qui est audax). Historian Herwig Wolfram theorizes that the name may derive from Pliny the Elder's island of Baltia (i.e., isle of the Balts), which he also calls Basilia (i.e., royal land).The Visigoths as a nation were formed under the rule of Alaric I, the first named Balt, only in 395. He famously sacked Rome in 410. His descendants continued to rule down to 531, when on the death of Amalaric the line went extinct. In 507, the Visigoths were defeated by the Franks at the Battle of Vouillé and lost most of their kingdom. In 511, the Ostrogothic king Theoderic the Great intervened to depose the Balt king Gesalec. He ruled himself until his death in 526, when Amalaric succeded him. Theoderic's intervention is often credited with saving the Visigothic kingdom, but it ended the Balt dynasty.The private wealth (res privata) of the Balt kings, which had been a foundation of their legitimacy, was transformed into the royal treasury (thesaurus regalis) and became state property after 531. The dynastic principle was abandoned and kings were chosen by election until the fall of the Visigothic kingdom in711. The brazen bull, bronze bull, or Sicilian bull, was allegedly a torture and execution device designed in ancient Greece. According to Diodorus Siculus, recounting the story in Bibliotheca historica, Perillos of Athens invented and proposed it to Phalaris, the tyrant of Akragas, Sicily, as a new means of executing criminals. The bull was said to be made entirely out of bronze, hollow, with a door in one side. According to legends the brazen bull was designed in the form and size of an actual bull and had an acoustic apparatus that converted screams into the sound of a bull. The condemned were locked inside the device, and a fire was set under it, heating the metal until the person inside was roasted to death. Some modern scholars question if the brazen bull ever really existed, attributing reports of the invention to early propaganda. A Senate of Cantabria mentioned in the Saint Aemilianus' work bears witness to a local nobility and a governing diet that may have been of the last independent Hispano-Roman provincial authorities. Some names are provided too, such as autochthonous Sicorius or Tuentius, with no clear ethnic affiliation, and Latin names Honorius and Nepotianus.In 581, right before major Frankish expeditions against the Basques and the establishment of the Duchy of Vasconia under Frank suzerainty, the count of Bordeaux Galactorius is cited by the poet Venantius Fortunatus as fighting both the Basques and the Cantabrians, while the Chronicle of Fredegar brings up a shadowy Francio duke of Cantabria ruling for a long period some time before Sisebut's successful campaigns against Basques and Cantabrians. Archaeological discoveries in the last decades around the millennium have brought to light that the cultural and economic influences, and even small groups of people in the near Basque territory once part of the duchy or limiting with it, came from way beyond the Pyrenees during this time gap of political vacuum or at the best, uncertain authority.In the late Visigothic period, at a second stage after the 6th century Cantabrian defeat, the Duchy of Cantabria is attested as being a buffer zone bearing witness to continuous fighting between Visigoths and Basques. In 670, the Visigothic king Wamba was campaigning there against the Basques when he heard of a rebellion in Septimania. Notice of a certain duke Peter of Cantabria, father of Alfonso I of Asturias, is attested on 9th century Asturian documents for the first years of the Umayyad conquest of Hispania. The Eighth Council of Toledo commenced on 16 December 653 in the church of the Holy Apostles in Toledo. It was attended by fifty two bishops personally – including the aged Gavinio of Calahorra, who had assisted at the Fourth Council – and another ten by delegation, ten abbots, and the archpriest and primicerius of the Cathedral. Also, for the first time, saecular officials, sixteen counts palatine, participated in the discussion, voting, and affirmation of the council's acts. It was the second of King Chindasuinth's two councils, held under the names of both he and his co-reigning son, Reccesuinth. The eighth council was unique in its calling in that Chindasuinth had written a tomus to the bishops describing the issues he wished them to address. The Fifth Council of Toledo was convoked by King Chintila and opened on 30 June 636 in the church of Saint Leocadia in Toledo. It was attended by twenty two bishops and two episcopal representatives. The bishops of Narbonensis were absent for political reasons. It primarily dealt with political matters. Only the higher nobility (with military functions) and the Visigothic palatine officials could participate in royal elections. The descendants of the king had the right to enjoy properties justly acquired by the king and willed to them. Anathema was pronounced on those who molested or injured the king. The closest councillors of the king were also protected in their possession of properties granted them by their royal patron. Those who consulted seers to know the future of the king, who cursed the king, or who plotted or conspired to place another on the throne would be excommunicated. Those who aspired to the throne without due election were also anathematised. The council established three days of litanies between 13 and 15 December each year.The councils decrees, however, failed in their chief political aim of securing the king on his throne and putting an end to internal intrigues. Chintila continued to have to fight dissenters while Spain was otherwise at peace with the outside world. In 638, Chintila was forced to convoke the Sixth Council of Toledo. The Fourth Council of Toledo occurred in 633. It was held at the church of Saint Leocadia in Toledo. Probably under the presidency of the noted Isidore of Seville, the council regulated many matters of discipline, decreed uniformity of liturgy throughout the Visigothic kingdom and took stringent measures against baptized Jews who had relapsed into their former faith. At this council, begun 5 December 633, all the bishops of Iberian Kingdoms were in attendance. Isidore, though elderly, presided over its deliberations, and was the originator of most of its enactments. The council probably expressed with tolerable accuracy the mind and influence of Isidore. The position and deference granted to the king is remarkable. The church is free and independent, yet bound in solemn allegiance to the acknowledged king: nothing is said of allegiance to the bishop of Rome. It was at the Fourth National Council of Toledo and through his influence that a decree was promulgated commanding and requiring all bishops to establish seminaries in their cathedral cities, along the lines of the school associated with Isidore already existing at Seville. Within his own jurisdiction he had availed himself of the resources of education to counteract the growing influence of Gothic barbarism. His was the quickening spirit that animated the educational movement of which Seville was the centre. The study of Greek and Hebrew as well as the liberal arts, was prescribed. Interest in law and medicine was also encouraged. Through the authority of the fourth council this policy of education was made obligatory upon all the bishops of the kingdom. Protofeudalism (Spanish: protofeudalismo / feudalismo prematuro) is a concept in medieval history, most especially the history of Spain, according to which the direct precursors of feudalism can be found at the height of the Middle Ages. Spanish historiography relies heavily on the concept and projects it onto the late Visigothic Kingdom, but its usage is generally deprecated in the English-language historiography of Spain (or anywhere else). The current tendency in English scholarship to downplay feudalism and reduce the usage of related terminology, especially its application to the Early Middle Ages, is in direct conflict with recent trends in Spanish historiography to push the start of feudalism back into the Visigothic period, sometimes seen as part of a tendency to "Europeanise" Spanish history. Decentralization was unavoidable, and power became a matter of personal relationship and example. The chief lieutenants of the crown were rewarded for their services by salaries or stipendia in the form of overlordship of land or temporary assignment of income from land held in precarium, that is, on a nominally revocable basis. This system was actually first used by the church to support local establishments, and by the seventh century was widely employed by the crown and also by the magnates (the high aristocracy) to pay their chief supporters and military retainers. The process of protofeudalization inevitably carried with it a splintering of juridical and economic sovereignty that further weakened political unity. French historian Céline Martin has disputed the reality of "protofeudalism" by pointing to the public nature of oaths of fidelity in the late Visigothic kingdom, where oaths were generally sworn by (local) populations and not by individual men to individual lords. Roger Collins has criticised the concept as little more than an attempt by Spanish academics to integrate Spanish history into that of Europe in general. Collins cites L. García Moreno as proclaiming "international unanimity in applying the adjective 'protofeudal' to the socio-political formation incarnated by the Kingdom of Toledo at the beginning of the eighth century". Collins, however, "thinks not". Michael Kulikowski cites the discovery of mid-7th-century trientes at El Bovalar as evidence for commercial activity in central Spain refuting the prevailing notion of "autarky" and protofeudal serfdom. The Second Council of Toledo was held by the bishops of the Visigothic Kingdom of Toledo in the city of Toledo in 527, under the presidency of the local bishop Montanus (Montà). The chief issue with which the synod dealt was Arianism. Septimania (French: Septimanie, IPA: [sɛptimani]; Occitan: Septimània, IPA: [septiˈmanjɔ]; Catalan: Septimània, IPA: [səptiˈmaniə]) is a historical region in modern-day south of France. It referred to the western part of the Roman province of Gallia Narbonensis that passed to the control of the Visigoths in 462, when Septimania was ceded to their king, Theodoric II. Under the Visigoths it was known as simply Gallia or Narbonensis. Septimania territory roughly corresponds with the former administrative region of Languedoc-Roussillon that merged into the new administrative region of Occitanie. Septimania passed briefly to the Emirate of Córdoba, which had been expanding from the south during the eighth century before its subsequent conquest by the Franks, who by the end of the ninth century termed it Gothia or the Gothic March (Marca Gothica). Septimania became a march of the Carolingian Empire and then West Francia down to the thirteenth century, though it was culturally and politically autonomous from northern France based central royal government. The region was under the influence of the people from the count territories of Toulouse, Provence, and ancient County of Barcelona. It was part of the wider cultural and linguistic region comprising the southern third of France known as Occitania. This area was finally brought under effective control of the French kings in the early 13th century as a result of the Albigensian Crusade after which it was assigned governors. From the end of the thirteenth century Septimania evolved into the royal province of Languedoc. The name "Septimania" may derive from part of the Roman name of the city of Béziers, Colonia Julia Septimanorum Beaterrae, which in turn alludes to the settlement of veterans of the Roman VII Legion in the city. Another possible derivation of the name is in reference to the seven cities (civitates) of the territory: Béziers, Elne, Agde, Narbonne, Lodève, Maguelonne, and Nîmes. Septimania extended to a line halfway between the Mediterranean and the Garonne River in the northwest; in the east the Rhône separated it from Provence; and to the south its boundary was formed by the Pyrenees. The Seventh Council of Toledo commenced on 18 November 646 and was attended by 41 bishops either personally or by delegation. It was the first of Chindasuinth's two councils. The law against treason was strengthened with the addition of a penalty of excommunication on offenders. This was partially in response to the will of the king, who had recently taking vigorous actions against supposed traitors. The mass executions were upheld as just by the council. The punishments for treason were extended to clergy without distinction. It was also determined that if any clergyman, regardless of rank, travelled to a foreign land to support activities contra the king or the Visigothic nobility or to assist a layman in doing the same, he was to be disgraced and made a permanent penitent, receiving communion only on his deathbed. Sippe is German for "clan, kindred, extended family" (Frisian Sibbe, Norse Sifjar). sib gemæne ond sacu restan.The Sippe came to be a cognatic, extended family unit, exactly analogous to the Scottish/Irish sept.Most of the information left about the nature and role of the Sippe is found in records left by the Lombards, Alamanni, and Bavarians. One of the functions of the Sippe was regulating use of forests. The average Sippe likely contained no more than 50 families. The Sippe seems to have been absorbed into the monogamous family later on; P.D. King asserts that this was already the case among the Visigoths during the time of the Visigothic Kingdom. The Sixth Council of Toledo was the second council convoked by King Chintila and opened on 9 January 638. It was attended by fifty three bishops, including those from Narbonensis who had not participated in the prior council for political reasons. The council was thus a reunion of the whole church of Spain (of both Hispania and Gallia). Its primary purpose was to reaffirm the decrees of the Fifth Council of 636 and to restore internal peace. Four of the nineteen canons of the council were specifically political, the rest covered Jews, monks, penitents, freedmen, holy orders, benefices, and ecclesiastical property. The council affirmed the Fifth Council's decrees about the security of the king and his family. It also excommunicated those who fled overseas and there plotted against the king or otherwise endangered him. Anathema was pronounced on all who attacked the king or conspired to overthrow him and usurp his throne. A successor to an assassinated king was dishonoured if he did not punish the regicides. The council confirmed the permanent possession of property given to the church by anyone and laid down punishments for simony. Finally, certain measures were first taken against the Jews, it seems to please the pope, who had demanded them in a letter. The Third Council of Toledo (589) marks the entry of Visigothic Spain into the Catholic Church, and known for codifying the filioque clause into Western Christianity. The council also enacted restrictions on Jews, and the conversion of the country to Catholic Christianity led to repeated conflict with the Jews. The Thirteenth Council of Toledo opened on 4 November 683. It was called by Erwig and consisted of 77 bishops, 5 abbots, 3 church dignitaries, and 27 palatine functionaries.The king asked for the pardon and rehabilitation of the rebels against King Wamba in 673. The bishops consented to return to the rebels and their descendants their possessions and positions. The pardon extended to all those who had been disgraced for the same reason since the reign of Chintila (636-640). Erwig desired that no vendettas should hamper his reign. The council also condemned forced confessions, necessitating justice without torture. They also imposed a maximum prison sentence. Finally, the council repeated the oft-rendered prohibition on harming the royal family after the death of the monarch. The Visigothic Code (Latin: Forum Iudicum, Liber Iudiciorum; Spanish: Libro de los Jueces, Book of the Judges), also called Lex Visigothorum (English: Law of the Visigoths), is a set of laws first promulgated by king Chindasuinth (642–653 AD) of the Visigothic Kingdom in his second year of rule (642–643) that survives only in fragments. In 654 his son, king Recceswinth (649–672), published the enlarged law code, which was the first law code that applied equally to the conquering Goths and the general population, of which the majority had Roman roots, and had lived under Roman laws. The code abolished the old tradition of having different laws for Romans (leges romanae) and Visigoths (leges barbarorum), and under which all the subjects of the Visigothic kingdom would stop being romani and gothi instead becoming hispani. In this way, all subjects of the kingdom were gathered under the same jurisdiction, eliminating social and legal differences, and allowing greater assimilation of the populations. As such, the Code marks the transition from the Roman law to Germanic law and is one of the best surviving examples of leges barbarorum. It combines elements of the Roman law, Catholic law and Germanic tribal customary law. The Visigoths (; Latin: Visigothi, Wisigothi, Vesi, Visi, Wesi, Wisi) were the western branches of the nomadic tribes of Germanic peoples referred to collectively as the Goths. These tribes flourished and spread throughout the late Roman Empire in Late Antiquity, or what is known as the Migration Period. The Visigoths emerged from earlier Gothic groups (possibly the Thervingi) who had invaded the Roman Empire beginning in 376 and had defeated the Romans at the Battle of Adrianople in 378. Relations between the Romans and the Visigoths were variable, alternately warring with one another and making treaties when convenient. The Visigoths invaded Italy under Alaric I and sacked Rome in 410. After the Visigoths sacked Rome, they began settling down, first in southern Gaul and eventually in Hispania, where they founded the Visigothic Kingdom and maintained a presence from the 5th to the 8th centuries AD.The Visigoths first settled in southern Gaul as foederati to the Romans – a relationship established in 418. However, they soon fell out with their Roman hosts (for reasons that are now obscure) and established their own kingdom with its capital at Toulouse. They next extended their authority into Hispania at the expense of the Suebi and Vandals. In 507, however, their rule in Gaul was ended by the Franks under Clovis I, who defeated them in the Battle of Vouillé. After that, the Visigoth kingdom was limited to Hispania, and they never again held territory north of the Pyrenees other than Septimania. A small, elite group of Visigoths came to dominate the governance of that region at the expense of those who had previously ruled there, particularly in the Byzantine province of Spania and the Kingdom of the Suebi. In or around 589, the Visigoths under Reccared I converted from Arianism to Nicene Christianity, gradually adopting the culture of their Hispano-Roman subjects. Their legal code, the Visigothic Code (completed in 654) abolished the longstanding practice of applying different laws for Romans and Visigoths. Once legal distinctions were no longer being made between Romani and Gothi, they became known collectively as Hispani. In the century that followed, the region was dominated by the Councils of Toledo and the episcopacy. (Little else is known about the Visigoths' history during the 7th century, since records are relatively sparse.) In 711 or 712, an invading force of Arabs and Berbers defeated the Visigoths in the Battle of Guadalete. Their king, Roderic, and many members of their governing elite were killed, and their kingdom rapidly collapsed. During their governance of Hispania, the Visigoths built several churches that survive. They also left many artifacts, which have been discovered in increasing numbers by archaeologists in recent times. The Treasure of Guarrazar of votive crowns and crosses is the most spectacular. They founded the only new cities in western Europe from the fall of the Western half of the Roman Empire until the rise of the Carolingian dynasty. Many Visigothic names are still in use in modern Spanish and Portuguese. Their most notable legacy, however, was the Visigothic Code, which served, among other things, as the basis for court procedure in most of Christian Iberia until the Late Middle Ages, centuries after the demise of the kingdom.